Centre for Contemporary Art, Lagos. The Centre for Contemporary Art, Lagos, invites young curators, art writers, critics, and practitioners involved in (or interested in becoming more involved in) art criticism and curating to a series of critical writing workshops that will take place throughout 2018. This forms an important part of the 12-month long programme to celebrate CCA, Lagos’ 10th anniversary. The workshops are designed to highlight recent shifts and activities in cultural production and in turn provide participants with tools to generate critical responses to a dynamic and vibrant art sector. The different sessions of the workshop will be led by seasoned professionals with a focus on strengthening participants' critical skills, especially in creating a discursive platform on the emerging art forms in the rapidly transforming Nigerian art industry. The development of modern art has been driven by the compass of a critical tradition. Critics played key roles in identifying, naming, questioning and shaping the numerous art movements and styles that have emerged since the late nineteenth century. In Nigeria, artists and writers like Ben Enwonwu, Frank Aig-Imoukhuede and Dele Jegede among several others, have played a significant role in the development of modern art in the country through writing and publishing relevant critical text. With the expansiveness of parameters of contemporary art covering a diversity of media and artistic practices from performance and dance to experimental music, it becomes a challenge for criticism to remain both expert and accessible. This fast-paced growth of contemporary artistic practice in Nigeria is yet to be matched by sufficient critical documentation that engages the numerous practices emerging from the country. It is perhaps dangerous for such fast developments to continue without supporting theoretical and critical narratives to make sense of it. This session is organized in partnership with Institut Français Nigeria. In this session, participants will learn how to imbue both specialist and casual audiences with the excitement of contemporary art. This session will aim to introduce participants to the different platforms for publishing criticism for maximum impact and the business of art publishing. It will also introduce participants to writing as a curatorial practice. Participants will discuss and explore possibilities of online and print publishing platforms and propose future projects. 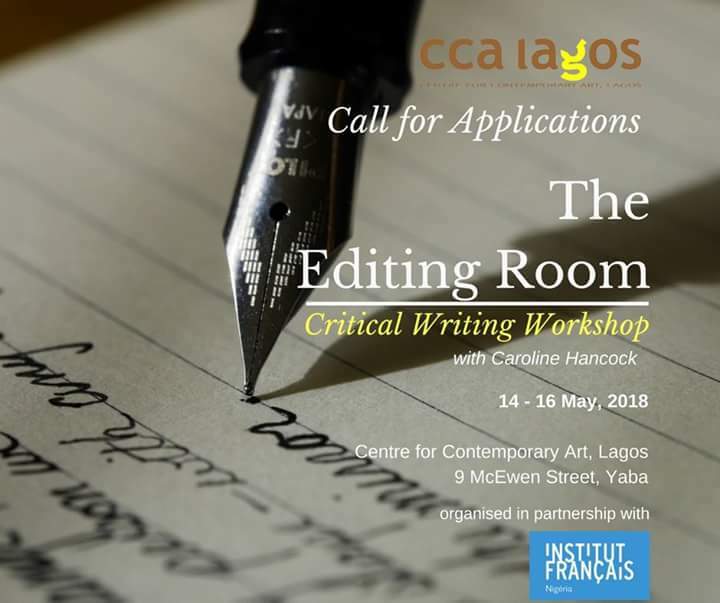 The various workshop exercises, which include discussions and writing exercises using the CCA Lagos’ current exhibition Publishing Against the Grain, as case study, are designed to fulfill these aims. To Apply please send a one-page Curriculum Vitae and sample review not less than 300 words of an exhibition, written within the past 12 months only to writingworkshop.ccalagos@gmail.com. Deadline for Application: 5pm May 4, 2018. Participation Fee: 3,000NGN for each workshop. Its best example of professional letter writing and I learnt how to use http://www.scriptwriting.biz/our-script-writing-services/video-script-writing-service/ tags in content.Your writing format actually inspired me and helped me a lot.Good effort. This is modern times letter writing style.I have been in this field of writing for more than a decade but I really got best ideas here which I shall surely implement in my writeups. The workshop which is really connected with the critical writing they probably doing their best to make this writing into a new great piece. Nice blog. It's so helpful. People get some help from here. Which people is weak in writing they can try this. I hope they will fell much better at this service. A nice job.